spring; Guardian and Giver of the gift of rejuvenation; Inventrix of the runic writing system. 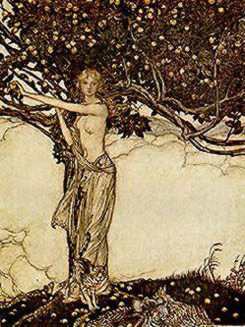 To Whom Sacred: golden apples (symbol of eternal youth and release from the tyranny of time); perhaps rowan berries (they may be the golden apples); walnut (into which She was transformed by Loki when recovering Her from abduction -- nuts: symbol of fertility); ashwood casket (in which She keeps the golden apples - if the Description: Golden Goddess of spring, flowers, blooming orchards, poetic inspiration and immortality; Emanation of earth's seasonal fruition; She Whose voice is to be heard in the music of running waters; She Who is to be experienced in the peace and stillness of the countryside; Seed of apples are rowan-berries then the casket maybe of mountain-ashwood). Male Associates: consort, Bragi, Leader, god of poetry. She was abducted, with Her apples, by the giant Thjazzi, [could be understood as winter and storm?]. She is also said to be the bride of Heimdall. One of the Asynjur, Goddesses, Who are linked with Frigg, Darling. Her connection with Heimdall may relate Her to Edda, Great-Grandmother. Perhaps an aspect of: Freya, Dearly-Beloved. Source: AMWv2 152-3; GMNE 70-71; GN.BB 142, 163, 207, 210, 254; WG.RG 314.
worked on: October 1995; August 1991.